"Twice we lost everything and had to start life again. I'm from here but technically I'm not from here either." 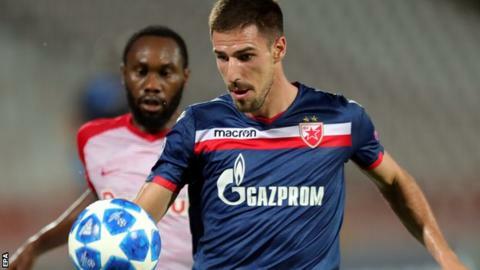 Milos Degenek's path to play for his beloved Red Star Belgrade has hardly been a smooth one as he prepares for their Champions League away game with Liverpool on Wednesday. His family had to leave Croatia, and then Serbia, before he turned six - both times as a refugee - and they eventually settled in Australia. The 24-year-old defender, who plays for his adopted country Australia, told the BBC World Football Show his remarkable story. Degenek was born in Knin, which is in Croatia - but at the time was part of the unrecognised Republic of Serbian Krajina, a region with a majority of people who saw themselves as Serbs. When he was 18 months old, his family had to move to the town of Arandelovac in Yugoslavia, now Serbia - with 200,000 Serbs displaced from Krajina after a battle for the region saw Croatia take control. The journey took them nine days on a tractor, with only milk and bread for sustenance. Only four years later they were on the move again as a result of Nato bombings that were part of the Kosovo War, which saw Degenek have to spend 48 hours at a time in an underground bunker. "It was a war between two religions, two people for no reason," said Degenek. "I don't like politics. It was a war that took its toll. A lot of people lost their lives, a lot of people lost their homes. Croatian, Serbians, Muslims - everyone lost lives. In 1995 we had to leave our town, leave our home and flee to Serbia. "It's not something we talk about much at home. It's not something you brag about. It's part of life - you look to the future and forget about the past. "You look to build something beautiful so you don't have to talk to your kids about the bad things and let them grow up in a positive, peaceful environment." Degenek found the move to Australia with his brother and parents difficult, because "none of us knew English". "It was a turning point in our lives - none of us knew where we were going. The first three or four weeks, I cried every night asking my parents 'where did you take us?'. We couldn't see our grandparents or any of our relatives. It was difficult. "We all grew up in these national teams [in Australian youth leagues] - you have a Croatian club, a Serbian club, an Aussie club, an Italian club. "I played for a Serbian club at the start but realised it wasn't the smartest club because it wasn't the place to develop or learn. Certain dads know the coaches and their sons have to play. "So I moved to an Aussie club and had a great few years there and moved on to the Institute of Sport. That's where my career took a turning point." 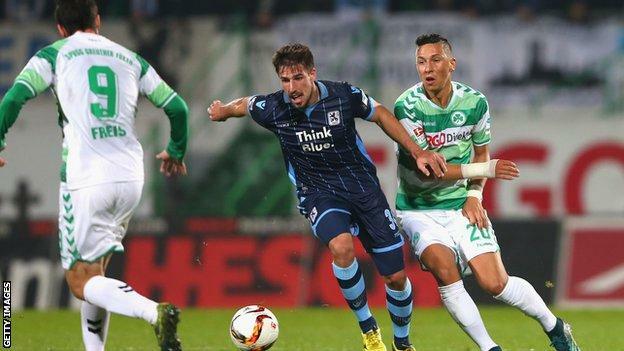 As a 17-year-old, Degenek moved to Stuttgart in Germany, where he spent three years with their youth and reserve teams, before joining second division 1860 Munich for another two seasons. One and a half years in Japan with Yokohama F Marinos followed before his switch to Red Star. 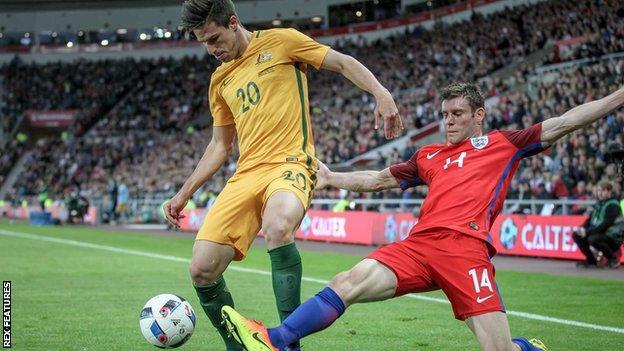 He said it was an easy decision to represent the Socceroos, making his debut against England in 2016 - the first of 18 caps. "I'm from here [Serbia] but technically I'm not from here either. I was born in Croatia, although it was then Yugoslavia which doesn't exist anymore. "I spent most of my life in Australia - it gave us most of what we have," he said. "I'm grateful for everything Australia did for me, that's why I'm proud to be an Australian and play for Australia. "The country gave us a chance to start our lives again and move on peacefully, not just me and my brother but my parents to build a home and a family after a very difficult period. "The decision was very simple. I didn't have to think much. When the call came in, that was straightforward. I played for the youth selections [Under-19 team] with Serbia but it didn't feel like home." Despite only living in what is now Serbia for about four years, he has always remained a supporter of Red Star. "Not just me, but my whole family. The village we were from, everyone was a Red Star supporter. That runs in the family. My whole family support Red Star and hopefully my kids will one day too. "In about 2002, Red Star came to Sydney for a game so I went and watched that. Pretty much every day [in Australia] I'd go on the Red Star website and they'd throw up videos of their training sessions. "And I'd try to see what the club was doing. I was paying attention to everything because I love the club and I always will. "There's always that one club you really love and support - you can play for a lot of clubs and like them and be part of them - but there's only that one club you truly love and that's the club you grow up with. "Even Lionel Messi has that with his Argentine club [Newell's Old Boys], even though he loves Barcelona and has been there for 18 years." He finally got his dream move this summer after 18 months in the J-League. "They'd been after me for three or four transfer windows but it wasn't the right time before. There's other things in life you need to worry about. "But after the World Cup, it was a move based on psychological happiness more than anything else. "I was in Japan - far away from my family. I love the country but this was more 'I want to be happy again and make my dreams come true'. "Now I'm back here - it's home but it's away from home. It's kind of mixed feelings. But the good thing is my family are here - my parents and my brother are here. That makes life easier. My football and psychologically, it helps me in all sorts of ways." Red Star, the 1992 European champions, reached the Champions League group stages for the first time in 25 years this season - and landed in a tough group with Liverpool, Napoli and Paris St-Germain. "You really felt that [the history]," he said. "The club has won the European Cup. Not every club can do that. "Napoli and PSG have never won it. All those clubs have financial abilities to win what they want when they want. "One Napoli player cost 60m euros. And our entire squad cost 44. But that doesn't matter. When you put in the history and fans, what this club has done and what it stands for, it's unbelievable. "We play with heart. We don't play for the money, we play for the respect. When I walk down the street, we only get positive vibes."